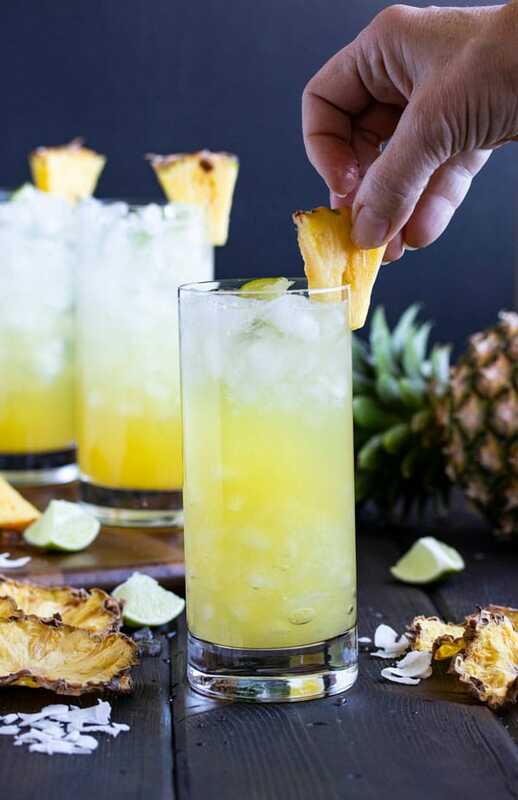 These pineapple and coconut rum drinks are like summer in a glass! Well not really, but it sure tastes like the tropics! If you have a beach themed party this summer, this is your drink! We’ve included a big batch recipe for your pool party below! We went with Malibu Coconut rum for these drinks, but there are many different kinds of coconut rum. I haven’t tried very many of them, but if you like, give another one a try. Let us know which your favorite is in the comments below! We decided to have some fun making these coconut pineapple cocktails so we cracked open a real coconut and used the juice to make these drinks. 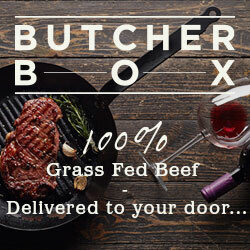 You cant get any fresher than that, can you? Cracking it open was fun, but we used a hammer and it was a challenge and try to save the coconut water. Debbie says we cheated because we didn’t do it like the people on survivor. Years ago my family lived in Haiti and my parents hired a Haitian man named Jeno to take care of our yard. He used to run/climb up a coconut tree while my brother and I watched fascinated that he could get up there so quick! Have you ever tried to climb a coconut tree? Its freeking hard! 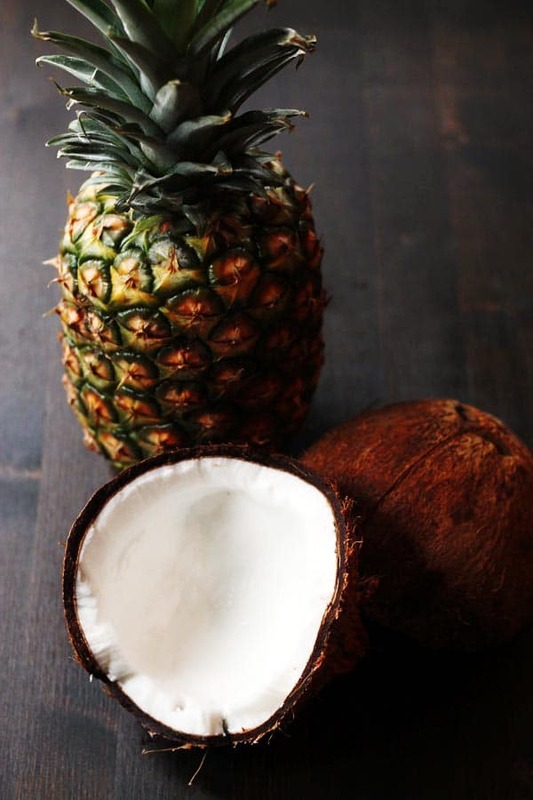 However, if you wanted to have a little fun and use a real coconut, look for young green coconuts and get your hands on this little coconut opening tool to make your life a lot easier! Harmless Coconut Water – this is raw coconut water, not pasteurized, and from young coconuts which is exactly what you want. Sparkling Coconut Water – if you want to add a little more sparkle to your drink, try using sparkling coconut water! 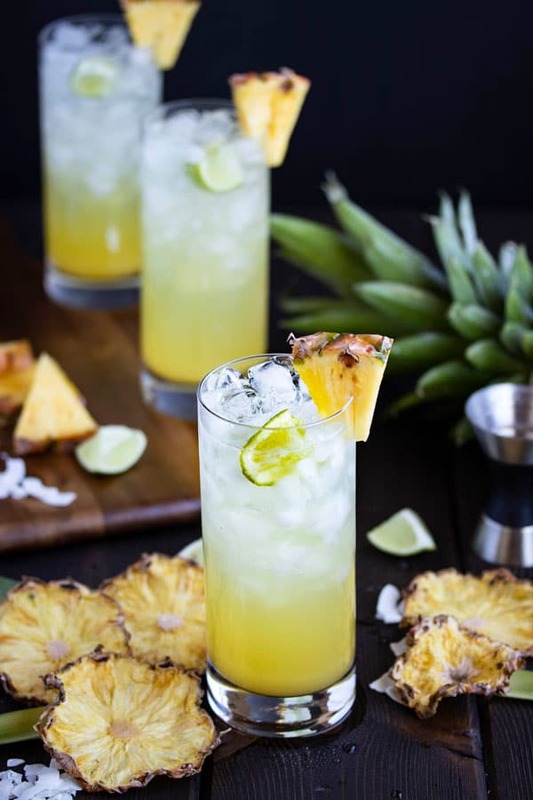 Not only are these rum drinks absolutely delicious and refreshing, they are also soooo easy to make! Fill a tall glass with ice. First add the white rum (1 1/2 oz) and Malibu Rum (1/2 oz). Next add the coconut water (1 oz), pineapple juice (3 oz) and squeeze in the lime juice (1 tbsp). Give it a good stir. Top it off with club soda (about 2 – 3 oz) and serve! So you want to make a bunch of these at once? I don’t blame you. You are going to want more than one… Plus if you are making cocktails for friends, its best to make a bunch at once. Mix the above ingredients in a pitcher. Then when you pour the drinks over ice, top with club soda. This pitcher recipe will make approximately 5 cocktails. This is also a GREAT way to make cocktails ahead of time. Mix up a pitcher or two and store in the fridge so you are ready even before guests come over! Better yet, triple or quadruple the above recipe and serve it in a big glass container with a dispenser so your guests can help themselves. Just keep the ice and the club soda in an ice bucket beside the container. Debbie is really loving this coconut tequila in her cocktails lately and that would work here as well! You could also possibly exchange the coconut rum for pineapple rum. You also could use pineapple or coconut vodka in a pinch. Feel free to exchange the white rum for dark rum too. I happen to love dark rum over white because it has so much more flavor, however it will make the cocktails a slightly different color. And as mentioned above, try sparkling coconut water for a little more bubble in your cocktail! 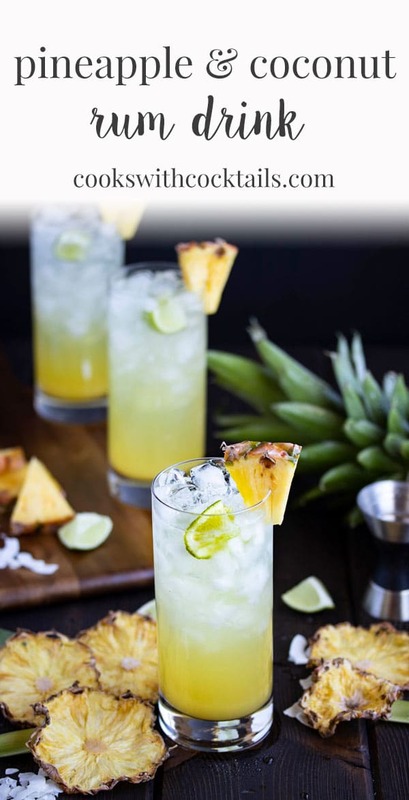 Enjoy a little taste of the Caribbean with these Coconut Pineapple Rum Drinks… Yum! 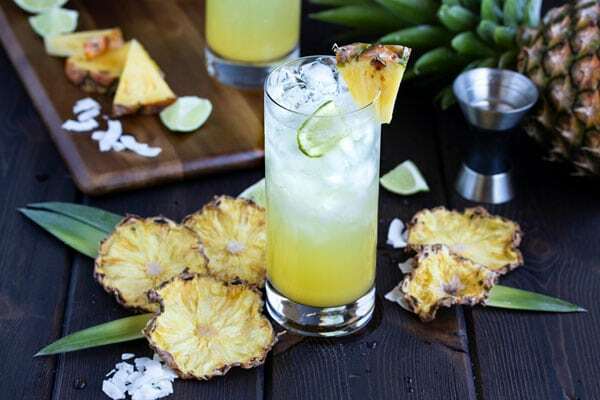 If you’ve tried these pineapple and coconut rum drinks then don’t forget to rate the recipe and let us know how it turned out in the comments below. We LOVE hearing from you! Fill a glass with ice. First add the rum and malibu. Next add the coconut water, pineapple juice and squeeze in the lime juice. Give it a good stir. Top it off with club soda and serve! We used real coconut water for fun but if you don't have any coconut handy you can always use Del Monte pineapple coconut water. Or Zico pure coconut water. love this drink, I make mine even simpler. 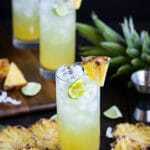 Coconut rum ( parrot Bay) pineapple juice & lime. I used to live in Aruba & we would poke the eyes on top of the coconut out with a screwdriver & tip up & drink. Might try instead of knife or machete. I will have to try with coconut water. This drink looks delicious!!! You mentioned soda as an ingredient. Could you please clarify? Do you mean plain club soda or something else? Hi Melissa, sorry we weren’t more clear. Yes, we mean club soda. Thank you, Ladies! I thought that it might be but wasn’t too sure. I can’t wait to try this and will let you know when I do. I LOVE your page, your energy, and your recipes!!! Your photos are FANTASTIC. I love the step-by-step instructions and the amazing attention to detail that you provide, You do an outstanding job!! and I can;t wait to get your updates.